NAIROBI, Sep 10 2014 (IPS) - When Kiprui Kibet pictures his future as a maize farmer in the fertile Uasin Gishu county in Kenya’s Rift Valley region, all he sees is the ever-decreasing plot of land that he has to farm on. Experts say that Africa’s extensive land subdivision is emerging as a significant threat to food security. Statistics by the Food and Agricultural Organisation of the United Nations (FAO) show that a majority of Africa’s farmers now farm on less than one hectare of land. According to FAO, in the last 10 years the land/person in agriculture ratio in Kenya declined from 0.264 to the current 0.219. 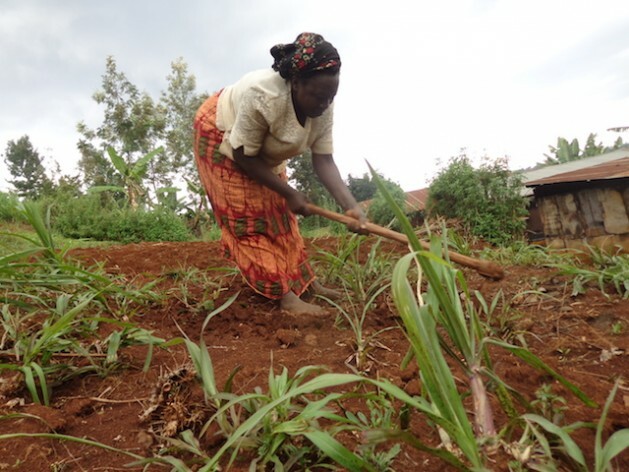 Explained as a percentage, this means that the number of people with one hectare of agricultural land in Kenya decreased by 17 percent over the last decade. Within the same period, the number of people with one hectare of agricultural land declined by 13 percent in Zambia and by 16 percent in Uganda. According to a 2012 USAID report titled “Emerging Land Issues in Africa”, 25 percent of young adults who grew up in rural areas did not inherit land because there was no land to inherit. “[People] just want to have a title deed even if it means subdividing the land to economically non-viable portions, while big investors are interested in high-value crops, particularly in horticulture, limiting available land for food crops,” Moshi says. Smallholder farmers across Africa account for at least 75 percent of agricultural outputs, according to FAO. “Small-scale farmers still produce more than big farms. Big farms often lie idle, investors hoard them for speculative purposes, they rarely grow food on this land,” Isaac Maiyo from Schemers, an agricultural community-based organisation in Kenya, tells IPS, explaining that 93 percent of farmers in Botswana are smallholders. “They [smallholder farmers in Botswana] have less than eight percent percent of the agricultural land and they still account for nearly 100 percent of the country’s maize production,” he says. In the southern African nation of Zambia, 41.9 percent of farms comprise of less than one hectare of land, with at least 75 percent of small-scale farmers farming on less than two hectares. In Zambia, 616,867 farms, which are on average less than a hectare, produce about 300,000 metric tonnes of maize. In contrast there are 6,626 Zambian farms of between 10 to 20 hectares that produce 145,000 metric tonnes of maize. Anthony Mokaya, of local NGO Kenya Lands Alliance, tells IPS that many countries on the continent are yet to establish laws that govern subdivision of agricultural land. “We subdivide not based on what the law says, but based on the number of dependents who want a share of available land, particularly where land inheritance is concerned,” Kibet explains. South African land owners are prohibited by the act from subdividing agricultural land without consent from the Ministry of Agriculture, Forestry and Fisheries. But as is the case with many African countries, Moshi says that subdivision of agricultural land has not been guided by the law. Amos Thiong’o from Agri-ProFocus Kenya, a network of organisations working in agribusiness, tells IPS that extensive land subdivision is also affecting mechanisation of agriculture. “Most families who, 10 to 20 years ago, had over 40 hectares now have to contend with less than a hectare. Meaning that the land is only used to set up a homestead, and to grow a few backyard vegetables and rear a few chickens,” Rotich tells IPS, explaining that previously a farmer could produce 28 to 38 90-kilogram maize bags on just 0.4 hectares of land. “One such bag is sold at a significant amount of 35 to 50 dollars depending on the region. But many farmers are now lucky if they produce 20 bags because they have their homestead, their cows, chickens and so on the 0.4 hectares [and it is not solely used for farming],” he says.